Sometimes I wonder just how much Noah comprehends about the world around him. How much he actually knows. It's hard to tell because he can't tell us. I know that when we pull up to his therapy office, he gets really excited because he loves his therapists. So he understands where we are and who we're there to see. He knows when Sara takes him to Subway, that he's going to get a sandwich. He loves their sandwiches. Sara says he always walks right in and goes to the high chairs, ready to sit and eat. He understands that when we put his shoes on, then we usually go outside to play or we go 'bye-bye'. But what about the stuff he can't vocalize to us yet? Like, is he paying attention when we sing the ABC's? Does he know the words to Rudolph the red nosed reindeer by heart? (We sing that one all year long for some reason.) Does he picture the letter E if I say "Where's the E"? Or, if I say Elmo's name, does he know who I'm talking about? I wonder what else he has locked up in that mysterious, beautiful little brain of his? Sometimes, when we least expect it, he gives us a glimpse. Like a little window we didn't even know existed just blows open unexpectedly on a cool autumn afternoon and lets the warm rays of light shine through. It's then that he shows us just how much he's been paying attention. And just how much he understands. For example, last month, while Sara was taking a shower, I was babysitting Noah. He was playing with his big, oversized Lego blocks. He likes the blocks, but he doesn't like to stack them. As a matter of fact, if I even try to stack them, he immediately unstacks them. No, he likes to either spread them all over the floor and "swim" in them or he will leave them in little piles in different parts of the house, like a squirrel saving nuts for the winter. Needless to say, we don't take the blocks out very often. But on this day, he asked for them. He actually pulled me over to the bookcase where I keep them on the very top shelf and asked me to pick him up and then he pointed to them. It was unusual since we don't play with them very often, and I actually almost said no, but we encourage that kind of communication, so this well thought out request got him his blocks. We sat down together and started to play. One of the first blocks he took out had a sticker with a number on it. This was something he had never noticed before and he immediately started looking for those particular blocks. He would pick up a block, inspect every side for a number and then unceremoniously toss it to the side if there wasn't one. Every one he found that did have a number on it, he would carefully put in his lap. I helped him look for all the numbers and was fortunate enough to find 1 thru 8 with none missing in between. I started stacking them, in order, on top of each other, counting them until the stack was 8 blocks tall. To my surprise, he watched me very intently without trying to disassemble them. When I was done he, very carefully, took the whole stack from me and started walking to the other room, again, without taking them apart. When he got to the living room, the stack fell over and crashed to the ground. I walked over to help him pick them up and handed him the number 1 and said "one". He took it, looked at it very closely and put it on the oversized ottoman in the middle of the room that he uses as a play table. He walked back over to the pile of blocks and looked very intently at each number on each block. He would pick it up and study it very closely and then move to the next one. He reminded me of those CSI characters looking for DNA on a small piece of plastic. He eventually landed on the 2 and turned around. I was surprised that he had gone in order, but chalked it up to coincidence. He placed the 2 down on the ottoman and came to get another one. I was curious at this point, so I just sat and watched. I didn't give him a clue as to what came next. I didn't make a sound. I wanted to see if he knew. He walked over to the pile, looked at each one again, a little quicker this time, and picked up the 3. Now at this point, I really started to pay attention. I wanted to call for Sara to come watch but I knew that might distract him and he would stop. Besides, what if it was still coincidence? It was only 3 in a row. I didn't want to get my hopes up. Or jinx it. So instead, I kept my mouth shut and kept watching as he placed the 3 on the ottoman and turned around again. He walked over to the pile and, this time, sat down. I thought it was over. I was thinking it was all just a coincidence. I was about to tell him which number came next, to try and pique his interest again, but then he reached over and picked up the 4!! I mean, I know he loves numbers. He always has. I know he's smart. I know he loves his number puzzle and his mommy has put it together with him more times than I can count. I know we count things with him all the time. Like grapes on his plate or leaves in the yard or cars on the road. But does he know? Does he actually know what each number looks like and what order to they go in? I kept watching, holding my breath, waiting. He came back over to his dwindling little pile of blocks and, this time, with no hesitation, picked up the 5. By this time, I could hardly contain my excitement. I knew he was doing this on purpose. There was no doubt about it! I still didn't interrupt him for fear that he would lose concentration. I watched him with a heart that was beating just a little too fast as he made his way back to his pile of blocks three more times, and three more times he came back with the right number. He had gone from 1 to 8 without one hint or clue from me. I'm not even sure he knew I was watching until he was done. Then I started screaming like a crazy lady. I was jumping up and down and clapping and acting like a second grader that just found out we would have three recesses today. And Noah? Well, he looked at me like I was losing my mind. And, in his defense, I guess I looked like that too. Finally, when I could start, let's say 'loudly praising' him, Sara heard me and ran into the room. I told her to watch as I placed all the blocks on the floor again. I handed him the 1 and he dutifully picked up every block after that, in order, all by himself. Now it was Sara's turn to act like a crazy lady. Now Noah was beginning to understand what a great thing he had done. He did his little trick each time someone walked into the room, and he got faster every time. We played that game all day long. Now, you see, the whole thing could have stopped here. That would have been all we knew about. That he recognized his numbers and could put them in order. We were left to figure out how to get him to show us more. To show us what else he knew. After playing with these blocks a few days, it occurred to me that he is just as in love with the alphabet. After all, his mommy does that puzzle even more than the numbers puzzle. 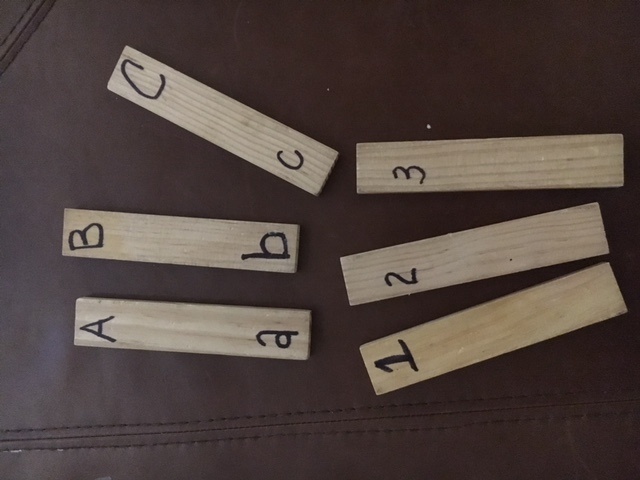 By this time, we had written all his numbers on little wooden planks, similar to Jenga blocks, so we could pack them easily in the diaper bag. So Sara and I decided to write some ABC's on more wooden planks, just like we had done for his numbers. We wrote A thru H on them and placed them on the floor in front of him. First, Sara took each one out, in order, said the name of the letter out loud and then placed it to the side. Noah was instantly fascinated! What were these new blocks with ABC's on them?! He was engrossed in the activity unfolding at his feet. He watched with great intensity as Sara picked up each one, named the letter, and put it down next to her. When she was done, she mixed them up again and said "Noah's turn". What happened next will never be forgotten by anyone in my household- ever. Without any hesitation, as if he had done this a thousand times before, he picked up the letter A and placed it to his side. Then he picked up the B. He continued to do this, with absolutely no help from me or his mommy, and picked up every letter after that. On his very first try. Well, let me tell you. You would think that child had just won an Olympic Gold medal in alphabet sorting by the way we reacted. We were hip-hip-hooraying and telling him how smart he was. Sara picked him up and swung him around and smothered him with kisses. He was grinning and giggling like he knew he had done something great. He was king of the castle. We were so proud. We started packing those number and alphabet blocks everywhere we went in case he got bored. (And just to show him off) He never got tired of them. This whole 'putting the numbers and letters in order thing' was a fluke. It happened by chance. What if I had not let him play with the blocks that day? We still wouldn't know what he knew. And what if we hadn't put the ABC's on them? We wouldn't know he knew that either. So what else are we possibly missing? What else is there that we don't know he knows? And here's the big question: How do we find out? What if he knows, or has the capability to know, something that could be really important to him. Like the piano. What if he's some piano prodigy but we won't know unless we give him lessons. Or soccer. He can run really fast. What if he's some soccer phenom that's just waiting to be discovered? I mean, I hate soccer. He's never going to learn if it's up to us. You see my dilemma? I can't ask him what he wants to do. And he can't tell me. So, I guess we just have to keep offering him different things at different times and see what happens. Let a little bit of fate take over. And hope we don't miss some big opportunity for him to show us what he knows. But, in this process, we've learned that we can't assume he doesn't know something just because he can't tell us. Actually, I think maybe just the opposite is true. Maybe we need to assume that he knows everything we've taught him. Like an all-seeing, all-knowing little cherub faced, blue-eyed angel. And one day, he will tell us everything he knows. Everything he's learned. And everything he wants to do. Until then, we just have to be patient. And pray he's not a soccer phenom.